Something unique your pet will completely love. Plus you can feel good that These handmade toys support fair trade. Natural materials perfect for hours of fun. Stimulating, earth-friendly toys made from materials cats will love for chase, play and interactive fun. Handmade using natural, renewable & recyclable materials like Palm Leaf, abaca & bamboo. No glues or plastics and all materials are 100% pet safe. Certified fair trade earth-friendly cooperative. Catnip filled fun colorful toys. Stimulating and enticing design. Encouraging cats natural instincts to chase, jump and play. 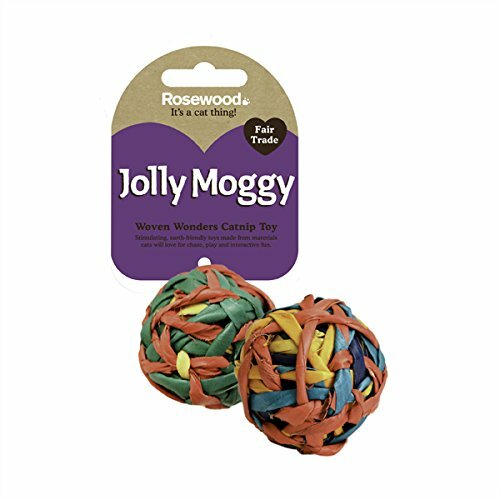 If you have any questions about this product by Rosewood Pet, contact us by completing and submitting the form below. If you are looking for a specif part number, please include it with your message.